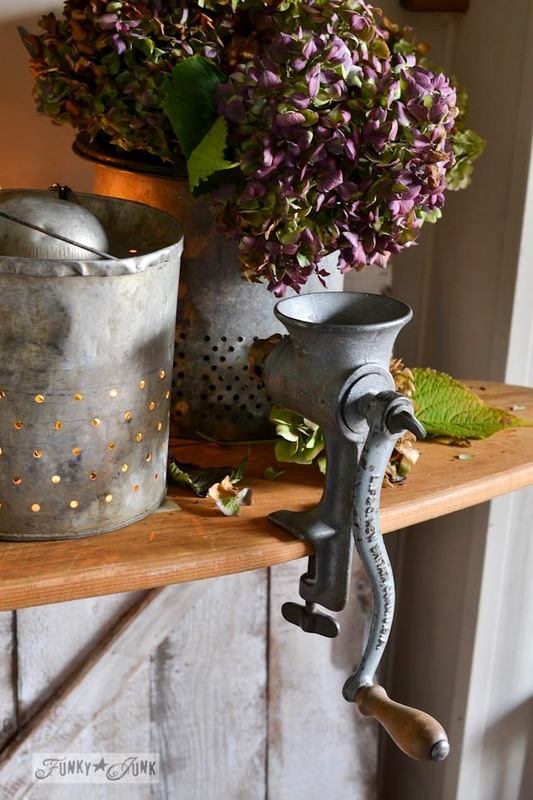 Fall Junkers Unite with an ironing board table, a pin board and a linkup! Greetings junkers! The team is back! 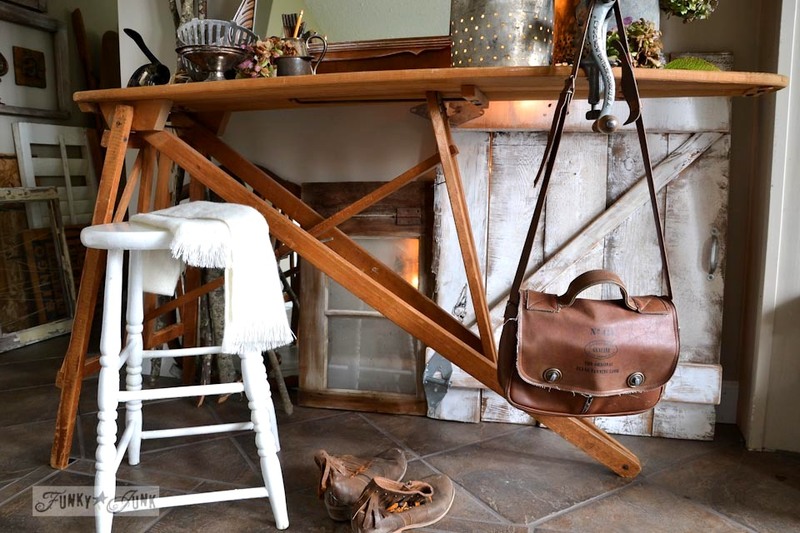 And this time, FALL junkers unite with an ironing board table, a pin board and a linkup! 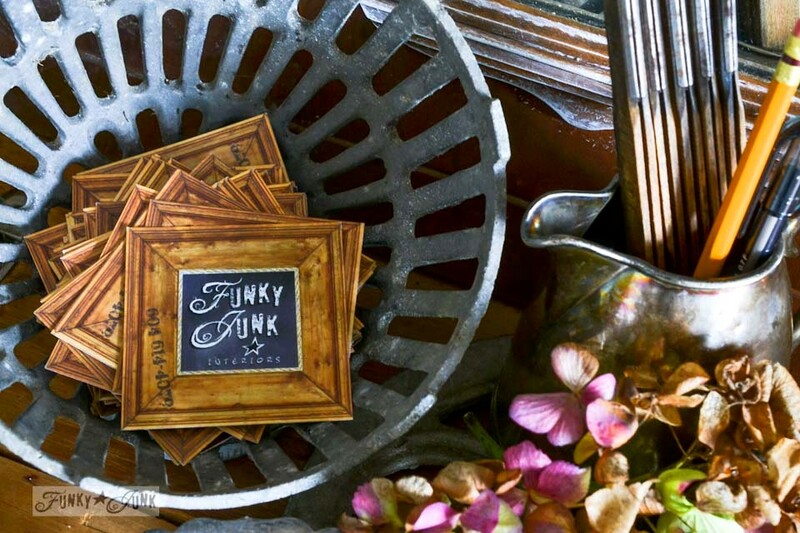 Funky Junk Interiors and my feature blog, I Love That Junk. Facebook, Pinterest, Twitter, Instagram and Hometalk. So ready for some new fall junk?! Let’s get started! 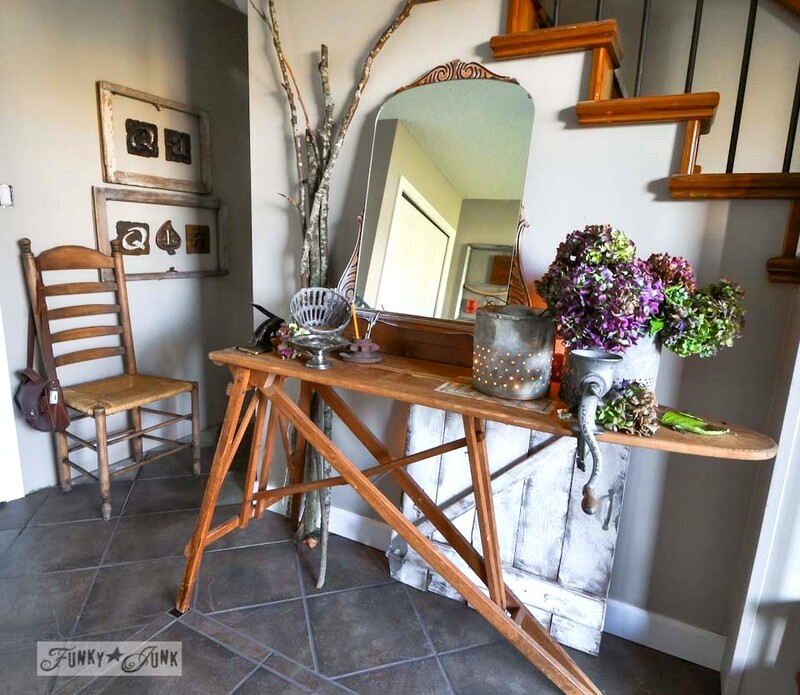 I love an entry way table for a drop station for all things front door, so I pulled out a vintage ironing board, married it to a like minded wood framed mirror, and the rest just fell into place. The fall touches are subtle… using branches and fall hydrangeas added just the right amount without taking over valuable space. 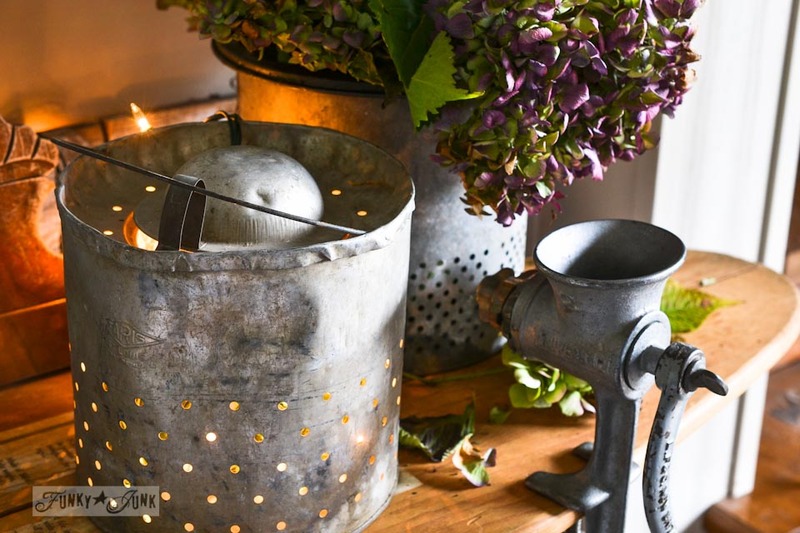 My very favourite part are the minnow baskets, with one holding some hydrangeas, and the other, white mini lights for a nice candlelit glow. With active cats in the house, I’m never comfortable with an open flame left unattended, so lights make this a safe option. The lights were tucked inside and I called it done! 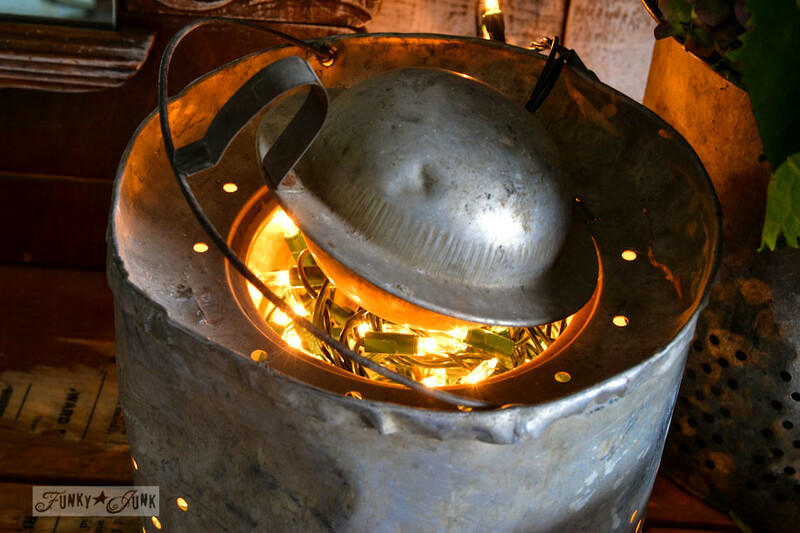 The metal bucket does get warm, so to be safe, a cork coaster was placed underneath for added heat protection. A vintage drain cover holds Funky Junk biz cards, and an old creamer scooped up from Farm and Found, part of The Urban Market on the weekend holds writing materials. 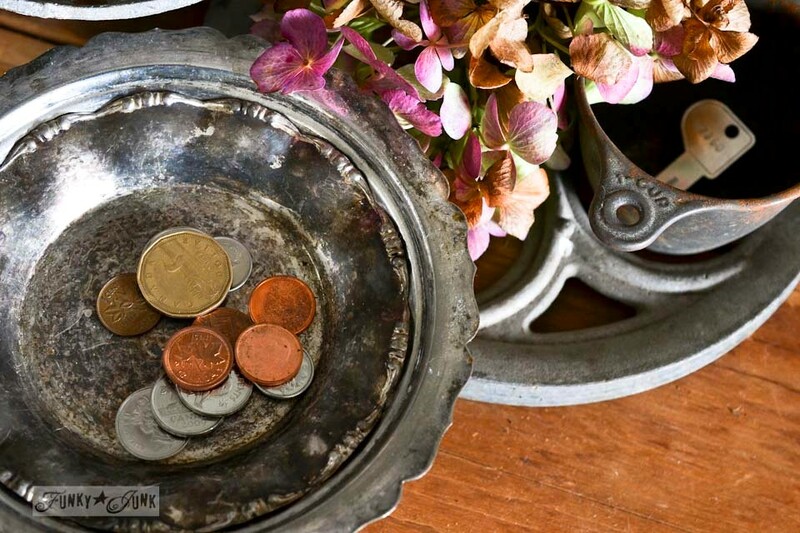 One always needs a place for spare change and keys too of course! The round thing to the right is a clothesline wheel holding the little metal rusty measuring cup in place for spare keys. Everything has a place. Now… I have another version but felt it didn’t represent as well on film. But was cool in person. 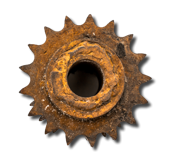 The Junkers United team have also been pinning like MAD, capturing the best fall junk on the net into one pin board! We’ll keep adding all year long so be sure to follow it if you like what you see! 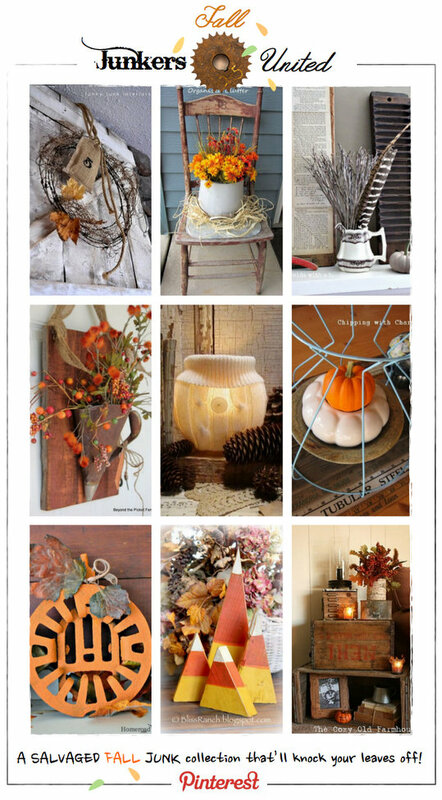 Click below to visit new fall junk projects by all! And the best part of all? All of these junk bloggers have a brand new fall junk project they’ve also whipped up on their own blogs! Visit each one by clicking each link below! Thanks for visiting! Happy Fall everyone! Super fun vignette. Love the minnow pail and ironing board. Hey! 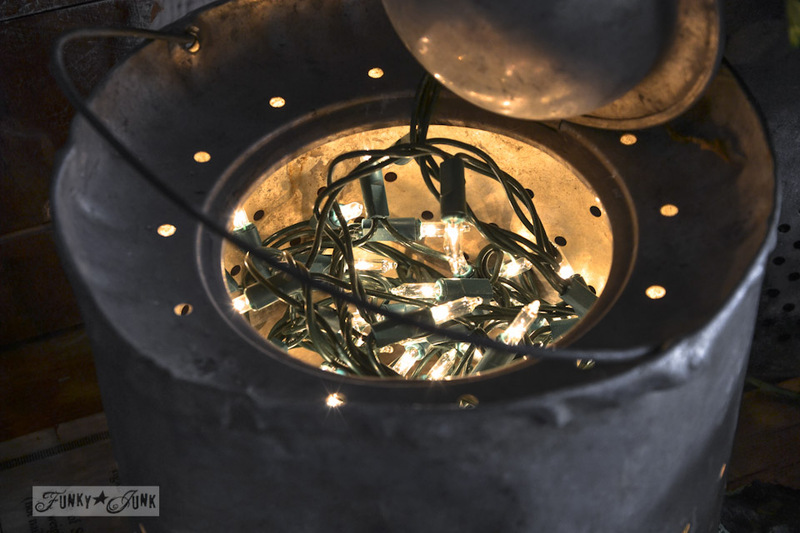 I really like the addition of the white lights – I’ll use almost ANY excuse to put up some “christmas” lights. I actually have some on my own front hall bench, right now! Just put them there the other night! I don’t think I’ve ever seen this particular angle in your house before! Cool! 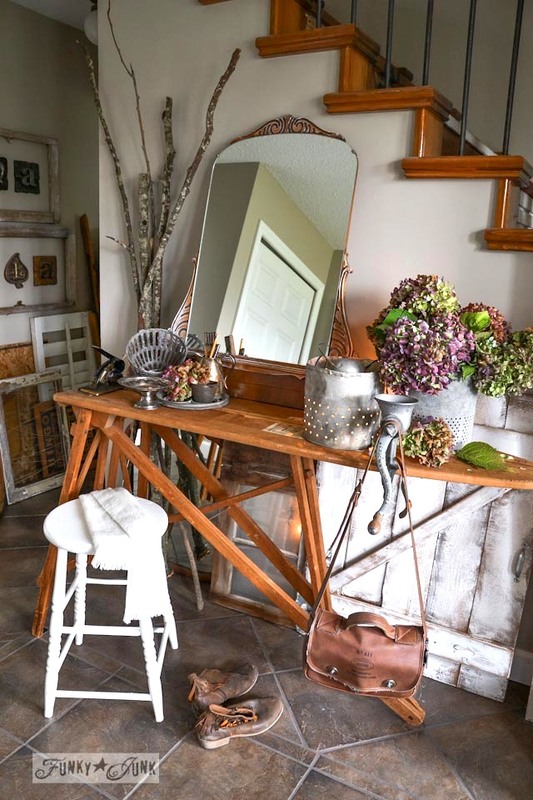 Love the mix of the wooden ironing board, metal pieces and natural elements. I am on the hunt for a minnow bucket now too! Ok, the minnow bucket has me looking sideways at all my galvanized stuff to punch holes in. Way cool with the lights inside. 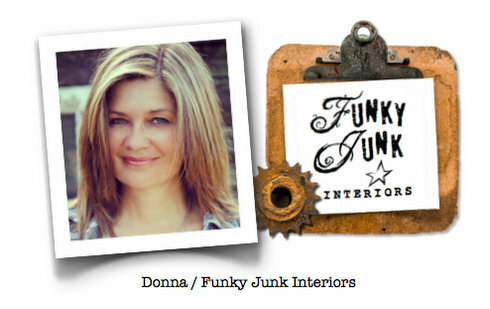 This melts my repurposed junk, vintage-lovin’ heart, Donna!! I love everything about it! I love it! 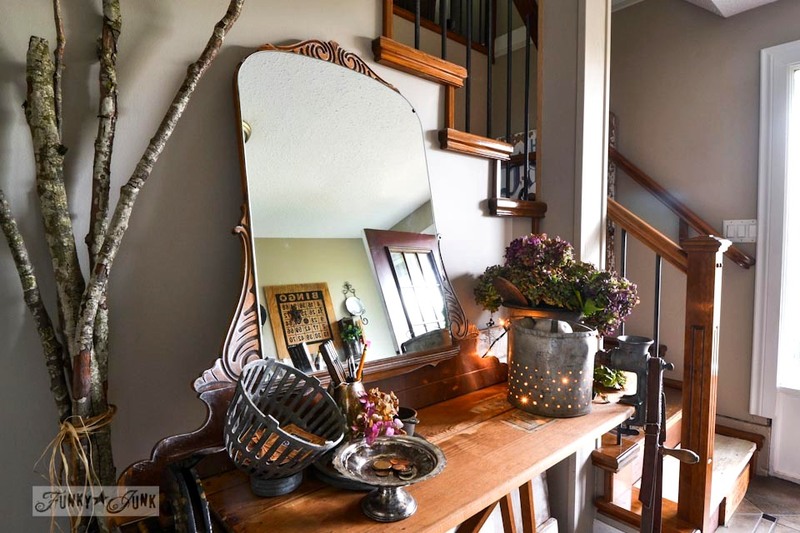 The wood, metal, and mirrors together is so warm and inviting. You are so talented. I get so much inspiration from you. I have a lot of things that belonged to my family that I just don’t know what to do with and your ideas are great. I’ve gotten some “grief” occasionally from family and friends about why I would want all this “old junk” but I just love it. I’m not sure why I just do. Thanks for sharing all your fantastic ideas. Also, you made me smile with your comment about it looking like someone lives under there. You are so cute! Your blog is so fun! I am so glad I found it! That ironing board used as a table is brilliant! Happy Fall. Here in SoCal it dropped 20′ in one day, going from warm days to cool ones overnight! I absolutely adore your front hall. 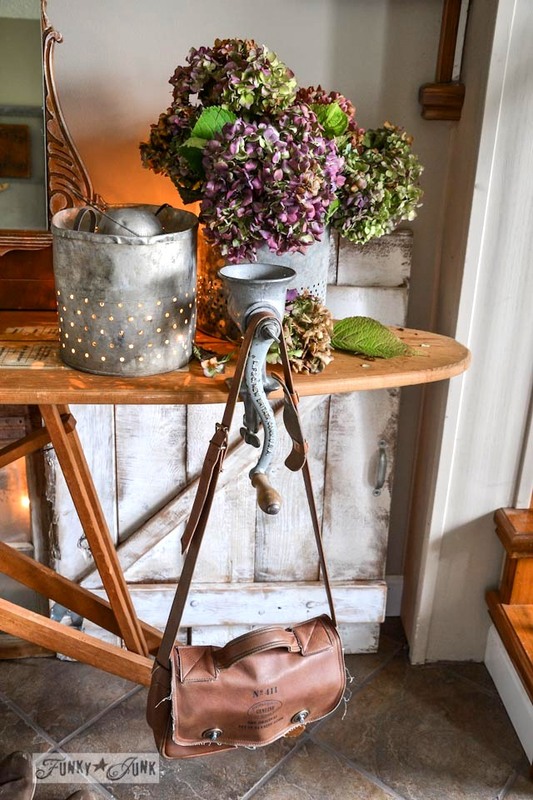 I saw a wood ironing board just like that at the flea market last weekend, but it was priced over $125–UGH! And my Mom still uses her iron meat grinder! I’ll have to make sure she doesn’t throw it away! Anyway, I love reading your blog–it’s so inspiring. i use an old ironing board as a bar when i have company.